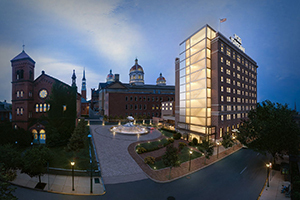 JDB Engineering was commissioned to provide mechanical, electrical, and plumbing engineering, as well as project management services, for the rejuvenation and redevelopment of a historic hotel. The scope include demolition of a structurally-deficient, non-historic wing, complete modernization of all guest rooms and engineered systems, and rehabilitation of historic areas like the ballroom and lobby. A new rooftop lounge was also designed to take advantage of the best views in the city.